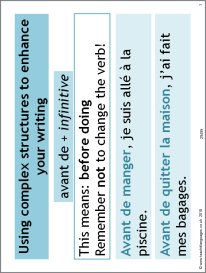 This resource introduces the use of 'avant de' and 'après avoir/être' to add complexity to written work on the topic of holidays. It includes a PowerPoint introduction and a worksheet. Excellent resource, clear and well structured. I used it with my year 10's and they found it easy to understand. Thanks for sharing.